Using this feature you can Create Several Static or Animated Cursors from existing images in one operation. This is what we call a batch procedure. 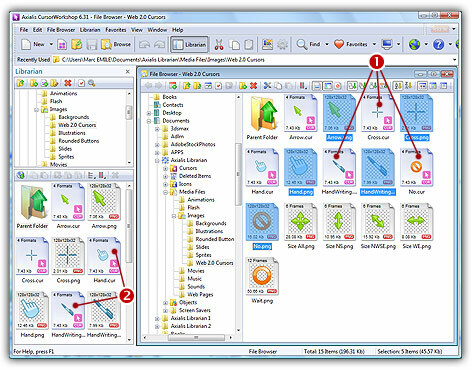 We'll perform this task using the built-in CursorWorkshop File Browser. In this tutorial, we'll use a set of 10 images in 128x128 PNG format. We'll create the 5 first cursors in Static CUR format and the 5 others in Animated ANI format. 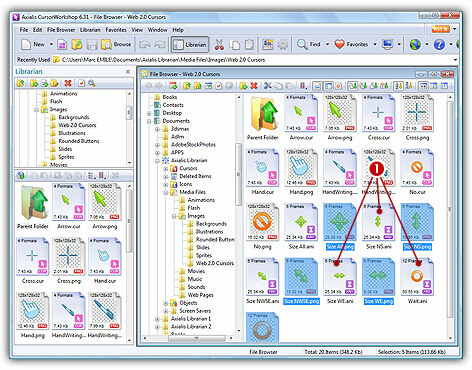 All the batch functions are available from the Axialis File Browser window. That's the reason why we'll start this tutorial by opening the folder which contains the images in this file browser, even if those files are located in the Librarian. 1. First, you must be sure the librarian is visible. If the librarian window is not visible, check the Librarian button in the main toolbar ( ) or press ESC. 2. Select the "Media Files/Images/Web 2.0 Cursors" folder ( ). In the thumbnail preview list (below), you see all the files included in the folder ( ). 3. Right-click in the librarian tree, a menu opens. 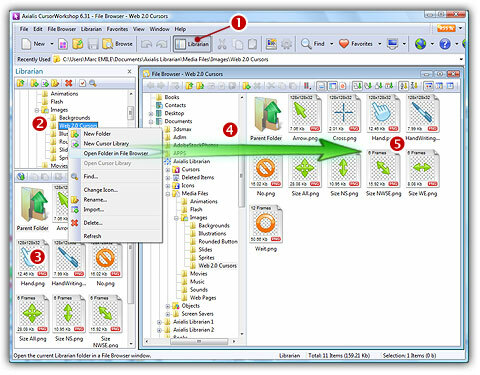 Choose the command "Open Folder in File Browser" ( ). A new File Browser window opens in the working area ( ) and the folder contents is automatically displayed. You see all the images displayed in thumbnail mode with preview. If this is not the case, be sure to select in menu: "File Browser/Display/Large Cursors" and "File Browser/Display/Auto Preview". 4. In the File Browser window, select the 5 static images in the list. To do this, click on the first image, press the SHIFT key (keep it pressed) and click on the 5th image. Files from "Arrow.png" to "No.png" are static. You can easily distinguish static images from animated images in thumbnail mode: The static images have the size and color depth displayed. The animated images have the number of frames displayed. 5. Right-click on one of the selected images, a menu opens. 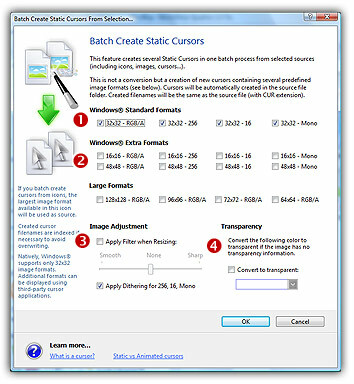 Select the command "Batch Create Static Cursors from Selection...". 6. A dialog box opens. In Windows Standard Formats ( ), select the 4 available formats. In Windows Extra Formats and Large Formats ( ) you can select additional formats that are not yet supported by Windows. We don't recommend you to select them for the moment. In Image Adjustment ( ), you can add smooth/sharp filters during the image downscaling. In Transparency group ( ), an option permits to use opaque images (i.e. without transparency) and specify a color to make transparent. Now we're going to create animated cursors from filmstrip PNG images. A filmstrip is a wide image containing an animation composed of several different images placed side-by-side. If you want to have a better idea of what is a filmstrip, double click on the file "Wait.png". The image opens in a separate document window. You can clearly see that the image contains several frames composing an animation. The size of the image is 1536x128 = 12 x 128x128 images. Close the image document before proceeding. 8. In the File Browser window, select the 5 last images in the list (animated images). Use the same method as above. 9. When the images are selected, Right-click on one of them, a menu opens. 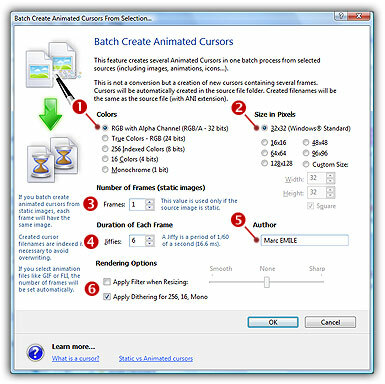 Select the command "Batch Create Animated Cursors from Selection". 10. A dialog box opens. In group Colors ( ) choose "RGB with Alpha Channel" and in Size in Pixels ( ) choose 32x32. In Number of Frames ( ), don't change the default value "1". This value is used for the source images which are static. This is not our case since the source images are animated. In Duration ( ), specify "6" Jiffies (approximately 100 ms per frame). In Author ( ), you can specify the name of the author if any. ANI files can contain 2 information strings: Name and Authors. In Image Adjustment ( ), you can add smooth/sharp filters during the image downscaling. 12. Let's take a look at a newly created cursor. Double-click on a animated cursor, for example "Wait.ani" and check the animation. Note that batch procedures don't permit to specify the hot spots which are set to (0,0) by default. You need to specify them manually by opening each cursor if necessary.